Sweet, juicy corn on the cob ready in minutes! No need to get a steamer basket or special accessories either. 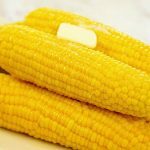 Follow this easy step-by-step guide to make Instant Pot Corn on the Cob. Shucking the corn and be sure to remove all of the silk. Place the stainless steel pot in the pressure cooker, add the steam rack/trivet to the bottom of the vessel. Pour in two cups of water. Add the corn in rows of three in a criss-cross pattern. Close and lock the pressure cooker, set on steam and set the timer for two minutes. When the time is up, turn off the pressure cooker and perform a quick release.